Presented by the American Society for Jewish Music and the American Jewish Historical Society, the concert at the Center for Jewish History. 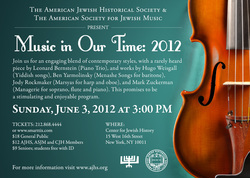 Music in Our Time: 2012, wrapped up ASJM's 2011-12 season on Sunday, June 3rd. (piano). In addition, Ben Yarmolinsky's (Menasche Songs, for baritone, set to texts by the late Samuel Menashe, who received the first “Neglected Master” award); Jody Rockmaker's (Marsyas for harp and oboe, based on the Greek myth of Marsyas finding the aulos (oboe) created by Athena); and the award-winning composer Mark Zuckerman's (Managerie for soprano, flute and piano, bases on texts by the French poet Robert Desnos), received wonderful performances by the students from Mannes College The New School of Music, were at were both impressive and moving.